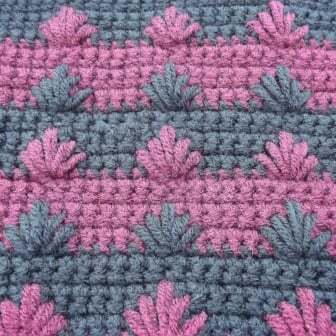 The puffy spike stitch is an excellent stitch for adding beautiful details to both sides of your crocheted work. Although the stitch does look slightly different on the wrong side, it’s not that noticeable. Unless you look closely, you might not even see the difference. 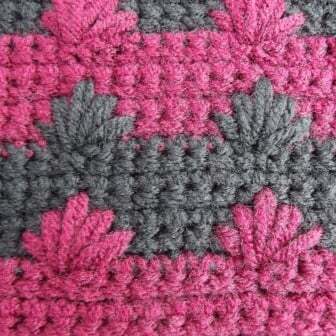 The stitch is basically a combination of the spike and puff stitches. It is worked by going down into the rows beneath and drawing up loops. All loops are kept on the hook until the last loop is drawn up. 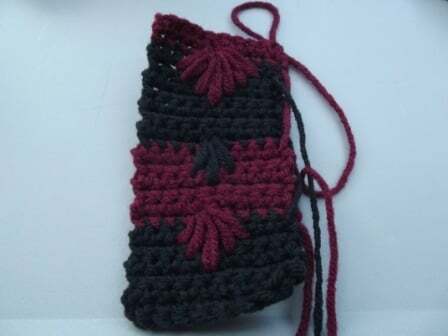 The yarn is then wrapped over the hook and pulled through all the loops on the hook. The stitch is then closed off with a chain. For this tutorial I’ll show you how to make it with five spikes. But if you wanted to, you could also make it with three or seven spikes. The concept is the same for all three – you just need more space to work the seven spikes than you do for the three spikes. If you want to see the variations, scroll down to the bottom for some images. 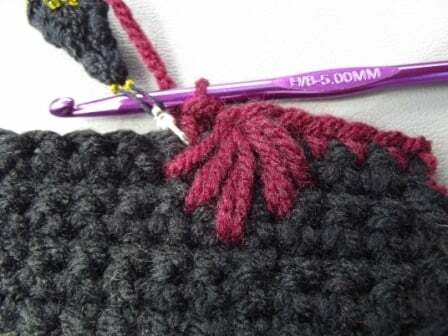 To the left you can see an image showing the right side of the stitch and to the right you see an image showing the wrong side. They are basically the same except for the slant is in the opposite direction. Notice how the right side slants to the left and the wrong side to the right. Aside from that, they are basically the same. 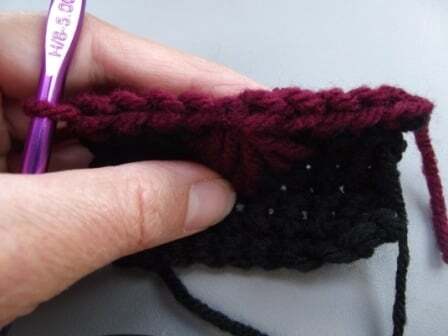 To make the puffy spike stitch make your stitches up to where the puffy spike stitch is to go. 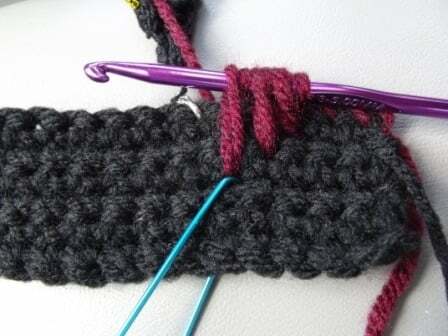 Skip the next stitch and place a stitch marker into the next stitch. 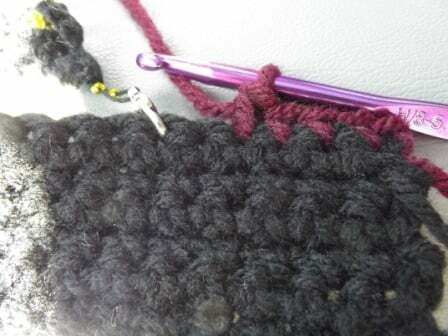 I’m lazy when it comes to using stitch markers, but in this case you need a marker there in order to know which stitch to crochet into next. 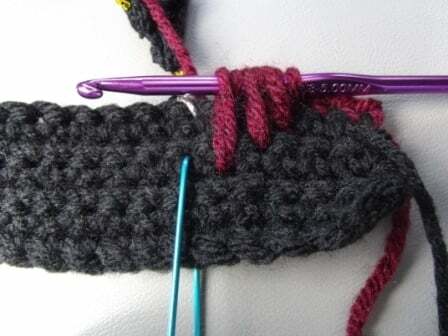 Otherwise the puff stitch will cover the area and you might end up guessing. 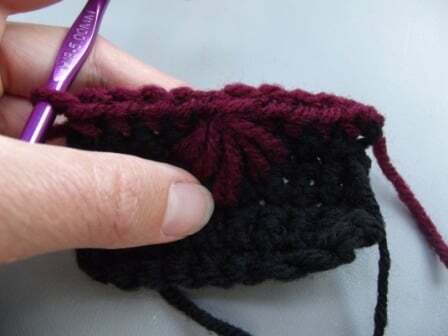 The skipped stitch is the center point of where the puff stitch is made and will not be worked into. 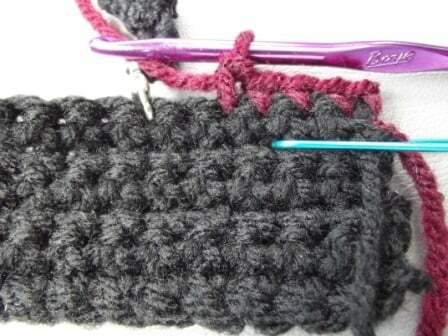 This is the stitch from where you do all your counting to the right and left. Count over 2 stitches to the right and 1 down. You don’t need a stitch marker here, but I used one to show where you will make your first spike. 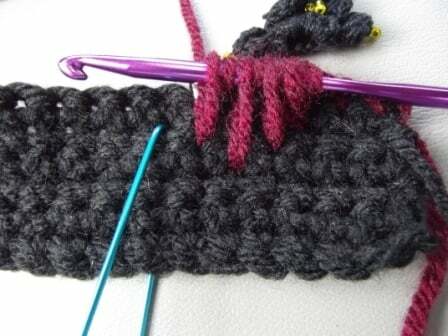 With yarn over hook, insert your hook into the marked stitch (2 sts to right and 1 row below). Wrap the yarn over and pull through. 3 loops on the hook. Step 4: Now count over 1 stitch to the right and 2 down. 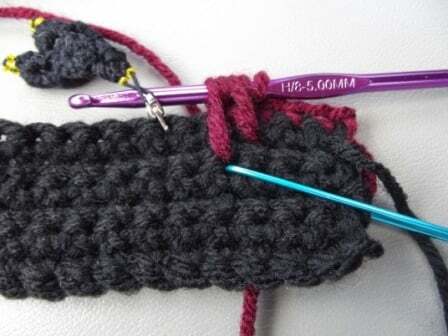 Again, I used a stitch marker, but it’s not needed for when you crochet. 1 st to the Right and 2 Rows Down. 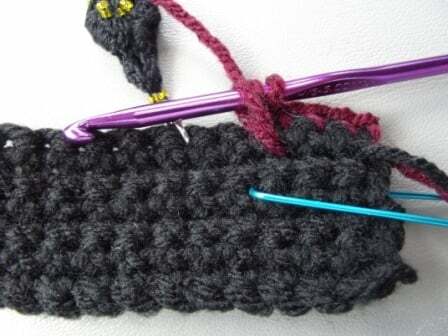 With yarn over hook, insert your hook into the marked stitch (1 st to right and 2 rows below). Wrap the yarn over and pull through. 5 loops on the hook. The third spike is worked straight down 3 rows below. 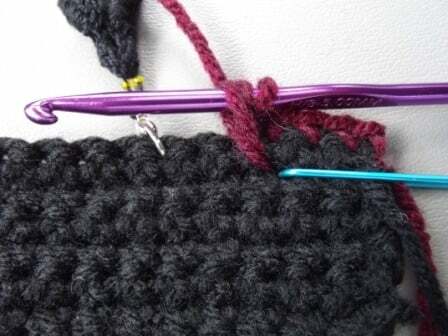 With yarn over hook, insert your hook into the marked stitch (3 rows below). Wrap the yarn over and pull through. 7 loops on the hook. Moving over to the left now, count over 1 stitch to the left and 2 rows below. 1 St to the Left and 2 Rows Down. 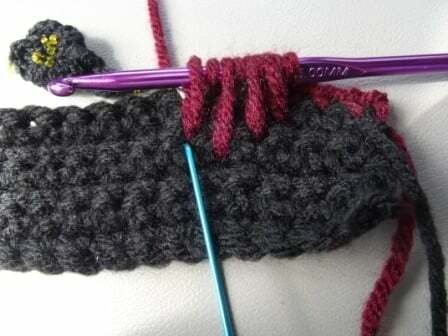 With yarn over hook, insert your hook into the marked stitch (1 st to the left and 2 rows below). Wrap the yarn over and pull through. 9 loops on the hook. 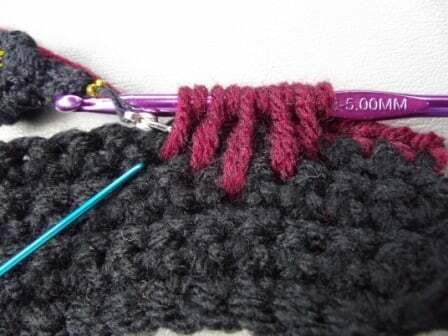 The last spike is worked 2 stitches to the left and 1 row below. 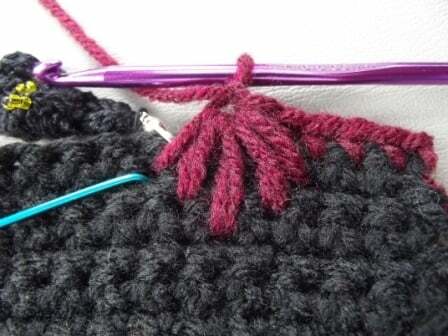 With yarn over hook, insert your hook into the marked stitch (2 sts to the left and 1 row below). Wrap the yarn over and pull through. 11 loops on the hook. Yarn over pull through all 11 loops. Chain 1 to close the stitch. 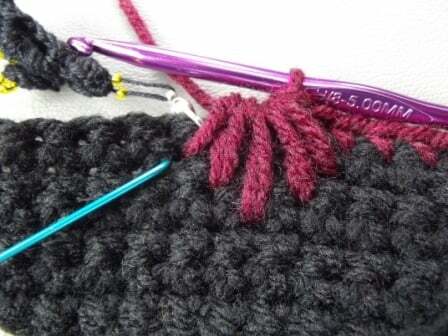 Work your next single crochet into the marked stitch of current row. Sc in Marked St of Last Row. 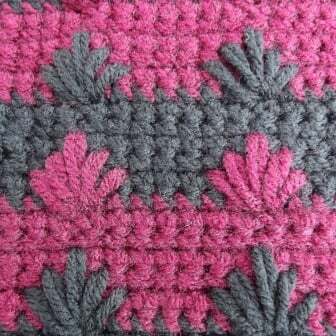 This is the top view of the stitch. 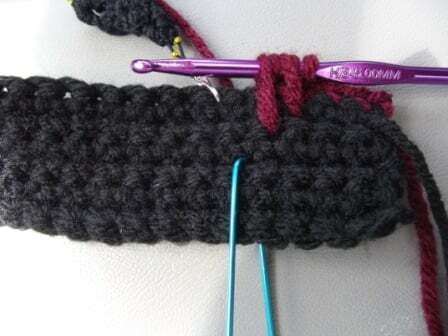 When you count your stitches it looks like you have 10 stitches in the row, but really you only have 9. If you look closely you’ll see that the one loop is smaller than the rest. This is technically the top of the spike stitch, but it’s much easier to skip that one and work into the stitches beside it. In this image you can see that the tighter stitch sits directly over the puffy spike stitch. Here are the three variations of the puffy spike stitch. 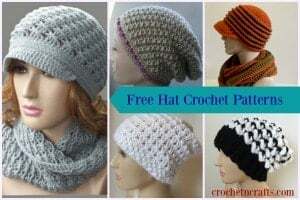 Do you have a video tutorial for this pattern? that will be very helpful. No I don’t at the moment. Sorry.